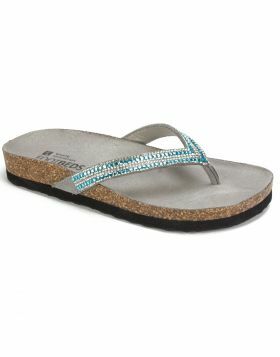 Light up your summer look with the chic styling of the Parana embellished t-strap sandal by White Mountain shoes. The knotted thong post adds a sporty ath-leisure vibe while the soft suedette cushioned footbed and flexible outsole provide all day comfort. 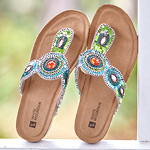 Light up your summer look with the chic styling of the Parana embellished t-strap sandal by White Mountain shoes. 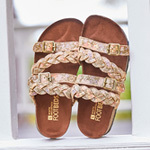 The knotted thong post adds a sporty ath-leisure vibe while the soft suedette cushioned footbed and flexible outsole provide all day comfort. Heel height: 3/4 inch.